David Fanshawe traveled to Kenya and Tanzania to record indigenous music. Witchcraft & Ritual Music is the culmination of his work. This CD consists of sixteen tracks. All but one is recorded in Kenya. The recordings are amazingly crisp and clear given the year they were recorded and the fact that these recordings were made in local settings and not in a recording studio. I feel the recordings were very successful. David managed to capture the music authentically. In his liner notes he says, "...I have tried to capture the spirit of a musical heritage now nearly extinct. The music on this album comes from a part of East Africa whose musical traditions remain largely unknown to the rest of the world. Particularly fascinating is the manner in which music and medicine are combined in the indigenous practice of witchcraft; music takes on the power of medicine, and medicine becomes associated with the healing sound ofdrums, interwoven with beautiful threads of melody." The tracks are music from various healing ceremonies, initiation rites, weddings, funerals, and folk music. Many of these traditions have gone by the wayside as western culture has crept in. One track is actually two songs. The Tuken Moral Songs are performed by two of the few traditonal singer left in Kenya. In this song you can heard their voices and a single instrument, the kibugantit. Many of these songs were performed with local, indigenous, instruments with the occasional western one creeping in. You can hear whistles in some of the tracks. One instrument is a chepkombis which is a bowl or pot with a skin stretched over it. A stick is placed on top of it vertically. The musician rubs his/her hands up and down the stick to prdouce some very eery sounds. Other instruments are kayamba (rattles), ankle-bells, flutes, cow bells, uta (1-stringed harp), kibugantit (a 6-stringed harp), nyatiti (an 8-stringed harp), lukuji (a mouth harp), bung'o horn, and of course drums. My only criticism about this CD is the title. There is only one track recorded in Tanzania. The CD title is Kenya & Tanzania which leads one to believe that roughly half the tracks are recorded in Kenya and the other half in Tanzania. 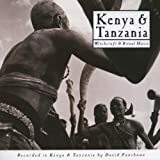 This CD should have been titled Kenya: Witchcraft & Ritual Music leaving off the one track recorded in Tanzania. This copy of "Witchcraft & Ritual Music" was purchased by me with my own funds.